On the cusp of the 2017-18 television season, Nielsen released an analysis indicating most of the video ad marketplace growth is coming not from linear TV, but from digital video ad spending. “TV remains a major component in the advertising space,” reads Nielsen’s 2017 “Commercial & Advertising Update,” noting that $61.1 billion was spent on TV advertising last season. That represents a 3.6% increase from the $59.0 billion advertisers spent on TV during the 2015-16 season, and tracks the overall expansion of the U.S. advertising marketplace. 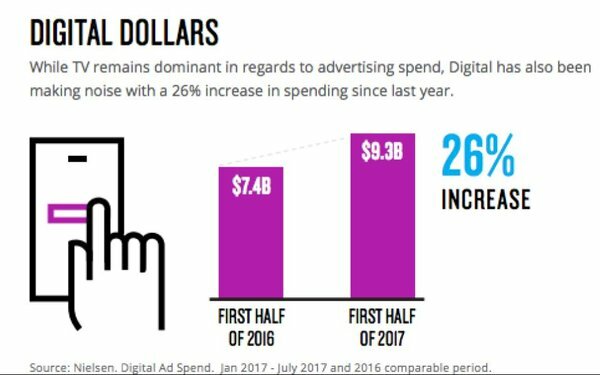 Digital video ad spending, by contrast, has expanded 26% to $9.3 billion during the first half of 2017.